Earlier today Kim Kardashian strolled out of a lunch date in Beverly Hills with Rob Kardashian and Blac Chyna like it was no big deal. 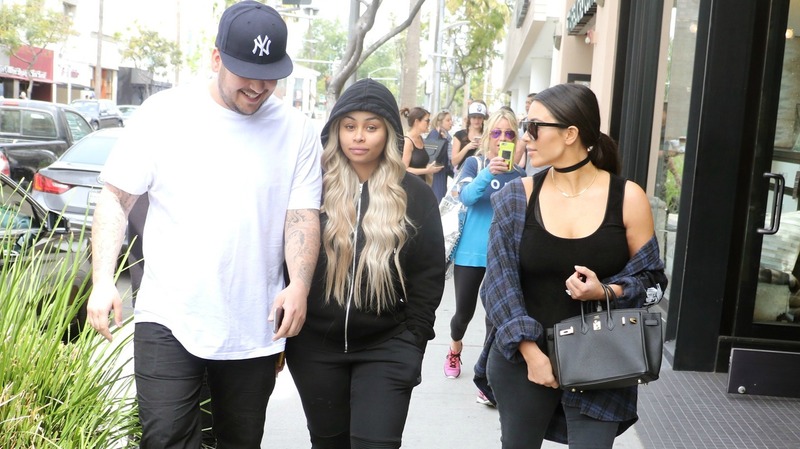 Kim has yet to congratulate or publicly acknowledge that her baby brother is engaged to Blac Chyna, but she did go to lunch with them, which begs the question: Is all this drama just to get the family more press? It’s no coincidence that Keeping Up with the Kardashians starts back up again this Sunday, and today is when Kim decided to bury the hatchet and go to lunch with the couple. Now that they’ve all been seen together, it just means more speculation, more times their names are mentioned in the media and more promotion for their TV show. And it’s working because here we are now. They’re nothing if not genius media manipulators. Really, if the end goal is to create more press for yourself, there’s nothing wrong with their strategy. They’ve been making millions of dollars off of it for almost a decade. But if you’re trying to create normal, healthy family relationships, this may not be the best course. I don’t think I could ever exist in a family where publicity comes first. Could you imagine the kind of politics and strategic thinking that goes into every move they make? From every post on Snapchat to the public appearances? I’m exhausted just thinking about it. At least Kim has given her blessing and support to Rob and Blac Chyna personally if not publicly. He’s struggled in the last few years, and now that he’s genuinely happy, he seems to want to reconnect with everyone in his life. Hopefully, the rest of the family, including Kris, will start to show signs of support in the near future. But if I had to guess, it’ll all happen right before the premiere of the newest Keeping Up with the Kardashians season. UPDATE April 27, 2016: The real motivation behind the olive branch being offered by the Kardashian sisters may have just been revealed. It is now being reported that prior to their lunch date, Kim accompanied the couple to a doctor’s appointment — but not just any doctor. They were spotted outside the offices of Kim’a own OB/GYN, who delivered her babies. So is Chyna having the next Kardashian baby? That could definitely explain the family’s sudden change of heart!